A new generation of man-portable air-defence systems (MANPADS) joins the Russian army’s arsenal. 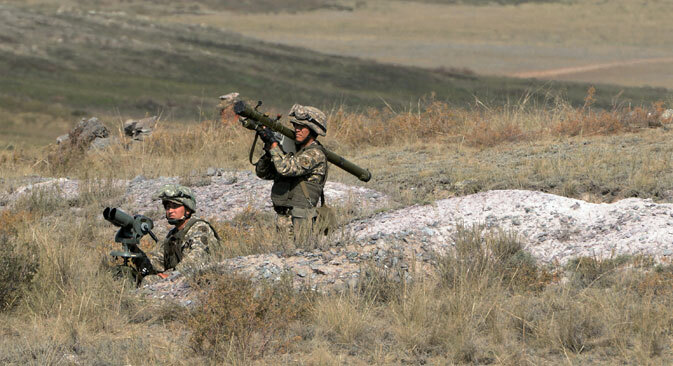 According to experts, the new MANPADS exceed their foreign counterparts in their tactical and technical characteristics. The Verba portable air defence missile system, which is capable of distinguishing its target from any interference, has joined the Russian forces to replace the presently armed Igla-S. The Verba portable air defense missile system, which was developed within the Instrument Design Bureau (belongs to Vysokotochnye sistemy holding), was integrated into one of the airborne troops divisions and in a motorized infantry brigade in the Eastern Military District. The newest man-portable air-defence systems (MANPADS) should replace the currently armed Igla-S systems. The same source told the publication that it is possible that in the near future the new MANPADS will replace the anti-aircraft defence arsenal, and there will also be models with either wheels or a tracked chassis. The main difference between the Verba and Russian MANPADS of the last generation is the heat-seeking multispectral optical heating-seeking head (GOS), through which the missile can distinguish the captured target from passive heat traps. These are now required elements in the defence systems of not only fighters, bombers, attack helicopters and attack aircraft, but also transport aircraft and helicopters. The Verba rocket can see its target in three spectra, so it is able to distinguish the target even in the case when so-called laser projectors attempt to blind the GOS MANPADS with their rays. The modern heat seeker can detect and engage targets with low thermal radiation, such as drones and cruise missiles. Not even helicopters with specially mounted devices that reduce the temperature of the engine exhaust are safe from the Verba. Most foreign MANPADS operate comfortably only in the course of pursuit, when the aircraft already flew past the position of the MANPADS operator, and the missile was fired after it, focusing on the thermal emissions coming from the aircraft’s engines. However, the Russian Verba with its 9m336 rocket can take the enemy head-on, with a frontal attack. In such a scenario, the multispectral optical heat-seeker does not recognize the heat emitted by the engine of the aircraft, but the heat that builds up on the wings and fuselage from air resistance. “In addition to its new heat-seeking head, the Russian Verba distinguishes itself from the Igla with its superior performance characteristics, in particular in the range and altitude at which it can hit its target,” the representative of the Russian Defence Ministry told RIR. While the majority of the actual characteristics of modern MANPADS remain tightly guarded, it has been voiced in media reports that the latest Verba rocket is able to hit a target at a distance of 6.5 km and at an altitude of 4.5 km. Its predecessor, the Igla, could reach its target at almost the same distance, but only at a height of 3.5 km. For the sake of comparison, the radius of the effective action of the American Stinger MANPADS is only 4.8 km in distance and 3.8 km in altitude. The new MANPADS, using the integrated automated control system (ACS) terminal, can be used both individually and as part of the battery. Through the ACS the commander uses data not only from ground radar, but also, according to some data, even from early radar warning aircraft. It can see its targets in advance, and then distribute them among operators of MANPADS in automatic mode. “Currently systems with similar performance characteristics, equipped with multispectral optical heat-seeking heads are operational only in the United States and France. Foreign systems are also used in combination with an automated troop command system. However, Russia's Verba is still superior to its foreign counterparts in its tactical and technical characteristics,” independent military expert Anton Lavrov told RIR.